When someone is speaking to you, he or she should have your full attention. There’s nothing more annoying than trying to have a conversation with someone who’s checking a phone or looking around the room—doing so shows great disrespect to the speaker. The good listener keeps his or her eyes on the other person. If you find your gaze wandering at any point, try alternating your vision between the speaker’s two eyes—focusing on one for a few moments, and then shifting to the other. It’s a simple trick like that can help you avoid distractions in your peripheral vision. Many people have trouble opening up and sharing their opinions or experiences—doing so leaves us vulnerable to judgment or rejection. Make sure that when you’re listening, you create a feeling of acceptance and not judgment. You want the speaker to feel safe in sharing. Focus your attention on hearing and understanding what is being said instead of planning how you will respond when it’s your turn to speak. People can tell if you’re not paying attention to them. Want to receive daily inspirational quotes like this? It’s difficult to speak to someone who just stares blankly at you and gives no indication that he or she is registering what you’re saying. When someone is communicating with you, signal your attention and interest through your body language. Lean forward, smile, and nod occasionally to encourage the speaker to continue—this shows interest. On the other hand, leaning back in your seat, crossing your arms over your chest, or staring at the floor tells the other person that you have little interest or openness in what he or she is saying. One great way to demonstrate that you’re listening is to rephrase and repeat a point the speaker has made. Doing so will show that you are actively thinking about what the other person is saying. Similarly, you should ask questions that help move the narrative along (“So what happened next?”) or clarify the person’s point (“In what sense?” or “How?”). When you ask intelligent questions, you signal your interest and also help encourage the speaker. One common mistake people make in communication is that they’re too quick to try to solve the other person’s problem instead of simply listening to them. Most people are not looking for a critique of their situation or an analysis of their options, they just want someone to empathize—to see things from their perspective. When someone opens up to you, avoid offering advice unless they ask for it. In most cases, he or she is just looking for someone to listen and understand. Be the person who listens to understand. 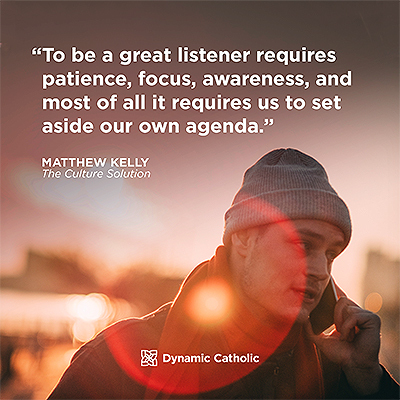 Make an effort to work on your ability to listen well and you’ll be amazed at how it will improve your life – as well as those who are fortunate enough to have you ear.